The lightweight and rugged Fido® NXT delivers fast, accurate, and consistent explosives detection capabilities for combat, physical security, and anti-terrorism operations. The expanded detection capabilities and reduced size of the Fido NXT enables the system to be easily integrated into existing security measures. 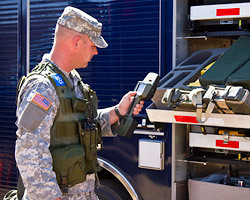 The system provides on-screen prompts and a Go/No Go response suitable for the majority of user actions to overcome issues related to intermittent usage and the associated loss of training knowledge, enabling both novice operators and explosives experts to use the device with confidence. Note: FLIR Fido XT is the successor to ICx Fido XT. Learn more about our Maintenance Management for the FLIR Fido XT and all of your analytical instruments. KD Analytical Maintenance Management is a suite of services that can save you money and time while helping to guarantee the readiness of your FLIR Fido NXT and all of your analytical instruments. ReadiTrak web-based asset readiness manager tracks instrument status, preventative maintenance, repair history, and maintenance costs of your Fido instruments and virtually any other gear your count on to do your job. One-call, 24x7x365 reachback support for Fido XT/NXT and all of your instruments, regardless of manufacturer. Our analytical instrument experts help you complete most maintenance and repairs over the phone, saving you money. Expert repair for your Fido provided by our support center. And, we manage OEM/warranty repairs when needed, eliminating headaches and reducing downtime for your team.